The Tibor de Nagy Gallery will present an exhibition of acrylic paintings by Sarah McEneaney which were completed over the last three years. The exhibition marks the artist’s sixth with the gallery and will showcase works from travels in the U.S., China and Ireland. McEneaney’s diaristic subject matter reflects her life experiences in intricate vivid detail rendered in her characteristic straightforward style which she has been developing for years. Underlying themes such as the landscape as defined by bodies of water or recumbent and reflective figures gazing outward from interior spaces link the many journeys conveyed in the exhibited works. They continue to add to the ever expanding autobiography of the artist. A majority of works were completed at the Ballinglen Art Center artist residency in Ireland where the artist lived and worked during the early months of last year. All of the works are painted on the Japanese plastic paper ‘yupo’ which allowed the artist to travel with her materials and upon return mount them to board. In the Irish countryside, McEneaney experienced the drastic diversities of the region’s climate, tides and geography. The exposed strata of sites such as Downpatrick Head echo the layers of the Grand Canyon, a heterogeneous stack of books or even layers of paint on a studio floor all of which are represented in the exhibition. McEneaney received a certificate from the Pennsylvania Academy of the Fine Arts and studied at Philadelphia College of the Arts. Her work has been included in numerous museum exhibitions including Pennsylvania Academy of Fine Arts and Philadelphia Museum of Art, and was the subject of a retrospective at The Institute of Contemporary Art in Philadelphia. She has had numerous solo exhibitions both in New York and Philadelphia, where she has lived and worked for many years. McEneaney was awarded a Purchase Prize from the Academy of Arts and Letters in New York. She has been awarded artist residencies at the Chinati Center, the Joan Mitchell Foundation and recently the Ballinglen Art Center of County Mayo in Ireland. 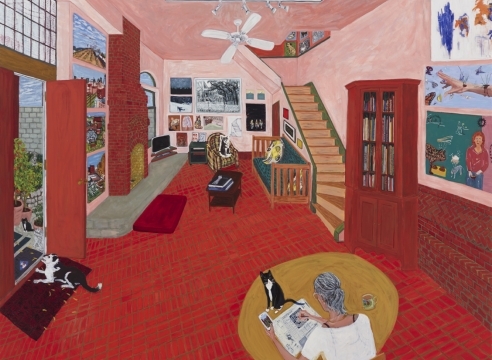 Her works were recently acquired by the Hood Museum at Dartmouth College and the Pennsylvania Academy of the Fine Arts.